Free Shipping Included! YakPads Gel-filled Canoe Seat by Yakpads at Lake Norman Wildlife. MPN: CANOE SEAT. Hurry! Limited time offer. Offer valid only while supplies last. For water sports enthusiasts and more casual recreationists alike, the Gel-Filled Canoe Seat by Yakpads is an excellent addition to your water gear. For water sports enthusiasts and more casual recreationists alike, the Gel-Filled Canoe Seat by Yakpads is an excellent addition to your water gear. The last thing you want after getting back to the shore is back pain or a sore backside from hard, plastic bench seats in your canoe. 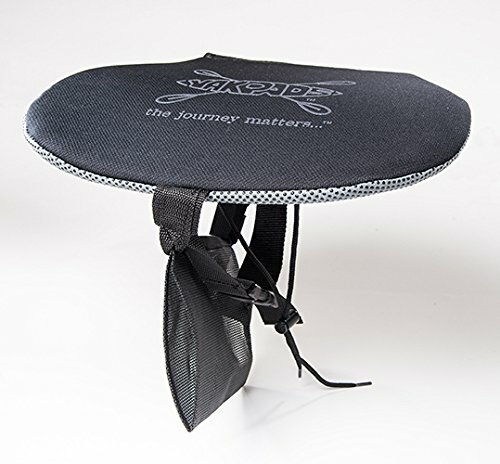 Since most canoes have uncomfortable seats , these portable seat cushions are a must-have for long days on the water. Each cushion is filled with specialized elastomer gel. This gel is similar to what is used in bicycle seats for maximum comfort and support. This gel is firm, yet flexible, and virtually eliminates potential pressure points, alleviating both existing and future pain. Unlike other foam cushions, this gel won't become compressed over time, so you can rely on these canoe seat pads to keep you comfortable for years to come. Additionally, the gel offers total insulation against hot or cold seats, helping to regulate your temperature and keeping you comfortably cool for hours of aquatic fun. The Gel-Filled Canoe Seat has fully adjustable straps and non-skid backing, so with its 14" x 11" dimensions, it fits easily onto seats of any size and won't slide around. It also comes with a special water bottle/thermos holder to ensure that you can maintain proper hydration without your water bottle getting in the way or bring along your favorite beverage for that morning paddle. These seats are designed to be comfortable for all ages and can eve be used outside the boat in a variety of situations, including seating at sporting events, in the car on a long road trip, or as a camping pillow in a pinch. These cushioned pads have convenient, wide coverage for all-over comfort. FOR MAXIMUM COMFORT IN THE BOAT: This Gel-Filled Canoe Seat by Yakpads is designed to offer maximum comfort and support when you're out on the lake in a canoe. Most canoes have hard, uncomfortable seats, so when you take along a seat pad by Yakpads along with your other kayaking or canoeing accessories, you know you're getting the very best. FULLY INSULATED AGAINST HOT OR COLD SEATS: These seat pads are gel-filled for full insulation against overly hot or cold seats. Whether you're out for a paddle down the river or lake or racing competitively, these cushions will be there every stroke of the way to ensure that you have a comfortable seat and no seat-related back pain. ADJUSTABLE FOR EASY INSTALLATION: These seats are designed with adjustable stabilizer straps so they can fit easily on any seat. They can even be used outside your boat, canoe, or kayak in other settings, like a sporting event at a stadium, in the car for added comfort, or even as a camping pillow in a pinch. MADE WITH ELASTOMER MATERIALS: The gel in these seats is made of elastomer materials, similar to what is used in bicycle seats which virtually eliminates potential pressure points. These seats are firm, yet flexible, and allow you to move around while rowing. Additionally, the gel won't bunch up like foam and other materials do over time, so you can have continuous comfort for years to come. FOR BOTH MEN & WOMEN: These seats are designed to accommodate everyone, from adult men and women to teens and kids. Regardless of what activity you find yourself doing, whether it's a casual day on the water, fishing, or a more competitive endeavor, you can be sure to cover all your bases with these gel-filled canoe and kayak seat pads by Yakpads. If you have any questions about this product by Yakpads, contact us by completing and submitting the form below. If you are looking for a specif part number, please include it with your message.